Last update: 3 January 2017. Version: 1.6.2 Platform: for WordPress . Track WordPress ranking on Google Rankie can track keywords ranking on Google and keep updating these ranks daily so it works as a WordPress SERP plugin. Generate ranking reports Rankie can generate ranking reports per month, per year or by all time letting you know how ranking is going? up or down with details on every single position change for each tracked keyword. As a wordpress rank reporter It also allows downloading these reports as PDF . Keyword research tool Rankie is not only a wordpress serp tracker plugin but also integrates a powerful keyword research tool that generates huge lists of valuable keywords you can target. Auto track searched keywords If someone visited your wordpress via a Google search and Google provided us by the keyword the visitor searched then the plugin can add this keyword to the dashboard for tracking . 4 different methods for locating positions The wordpress rank tracker provide 4 different methods to choose from for site locating postion on Google for keywords. Daily report email Plugin can send you a daily email with each position transition up or down . Ranking grap for each keyword Plugin records unique ranking records and generate a ranking graph for each keyword being tracked . Easy filtering The wordpress rank tracker plugin allow Keywords tracked to be instantly filtered by site,group or by search term . Proxy support as a wordpress google rank plugin Rankie can use proxies when accessing Google for search. Detailed action log The wordpress rank checker stores every single action done by the plugin. – Extract the downloaded file from СodeHolder you will find a folder called “www” . open it and you will find .zip file which is the right plugin file that should be uploaded to WordPress. Need support for WordPress Rank Tracker ? The plugin includes free support. Got a problem? Don’t worry, we have a help desk setup just for your help. 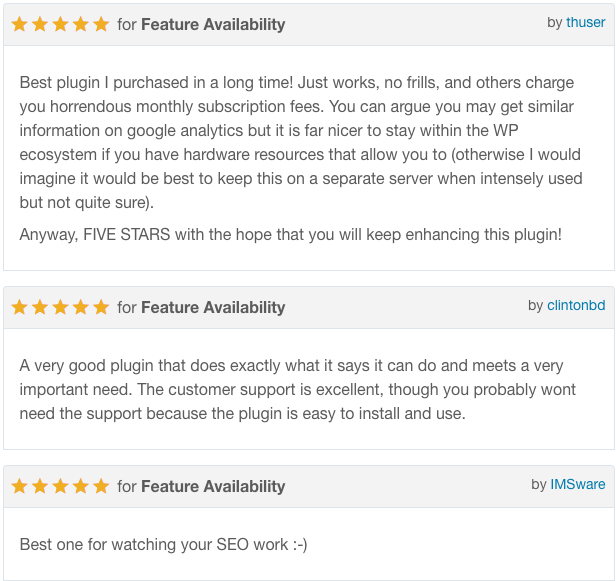 Submit a support ticket and we are always happy to help make you happy choosing our plugin. Please contact me before rating the item so we can fix any issue together. also if you have any question feel free to ask . * 3 days up to 720 keywords. * 4 days up to 960 keywords. * 5 days up to 1200 keywords. * 6 days up to 1440 keywords. * 7 days up to 1680 keywords. NEW: update interval option to update keywords daily, each two days, each three and so on. Fix:Google directly method started to report ip blocked (even if not blocked) now fixed. Fix: whatsmyserp method stopped working now updated to work. Fix: Catch keyword feature fixed. Didn’t find the plugin much good. Connected it with the API to get the best possible results and it was never acccurate. The keyword research tool was terrrible. It didnt work correctly and the suggestions were useless. A lot of the time i could search google and see that my site was #1 for a keyword. Went back to the plugin and it might say #15. Sometimes it wasnt finding rankings at all. Doesn’t seem to work… Poor user interface. Doesnt update after a while even though some of our keywords are still in the top 100 results… we’re even using less than 480 keywords which means that the plugin should be updated every 2 days, but still it doesnt change a thing. Todo muy bien. Funciona tal cual la descripción. Rankie is excellent. The only thing better is Muhamed’s support. this plugin does nothing. It doesnt tell what our keyword ranks are just stays at zero yet when we look at our keyword ranks in google search console the ranks go up and down. Nothing that Google Analytics / Search Console doesn’t do for free. The plugin does what it’s supposed to. It’s comfortable to not have to leave your WordPress backend in order to check how your keywords are doing in some other software. It has a good price but, above all, the customer support is very good. The developer answers very fast and very helpful. I have changed my initial rating because this actually works but it update keywords very slowly. Everything is great about this plugin for tracking keywords. Love the functionality of this plugin and is my favorite that I’ve bought. I love this theme. I’ve had an online magazine for 11 years, and this is so streamlined and honed out so well, with great design features you can configure how you want. I recommend highly. Great support as well. Very nice support and quick. He answered me with images point out graphically the solution to my problem. Thanks a lot! This plugin has performance issue, it slows my site by 70%, pages take over 90 second to load, after disabling and deleting the plugin every page load time is less than a second, the author must pay attention to performance!!! my Purchase code does not work，The author ignores this.Service attitude is too bad. Amazing plugin! its my favorite in codecanyon, i can wait for the next version and see more things to come. Plugin does not work correctly. There is no response from support since 9 days now. i didnt see my country + bug refund please. My Ranks get down and ip spam start scoring. In the beginning it was a very good plugin. So we purchased for some of our clients this plug-in but now it doesn’t work at all. Updating the keywords give 0 as result but it is ranked at position 2 or with another keyword it hold the position it had but doens’t update it at all even manually the output is stil the same position as the real position si totally different… None of the Rankie plug-ins on our website does work anymore…. A very good plugin that does exactly what it says it can do and meets a very important need. The customer support is excellent, though you probably wont need the support because the plugin is easy to install and use. doesn’t work anymore, Google made changes and author refuses to update. I asked for support and got none. Regrettably only a 3 star I was sold on this plugin after plenty of research, but over time it seemed awkward to work with and difficult to track my site ranking as if the plugin had just stopped. Either way, I tried to work with the plugin but have found other easy to work with software. I did not contact support as once I set it up it seem to work fine but then, it faded away on tracking my ranking over time. Its been deleted now on my site. I’m sure the developer may have better guides now or updated the plugin. One day it just stopped working. I contacted customer support and received no word whatsoever. It’s a shame because it’s a good plugin when it works. Now when I paste the license code (fresh from envato download page), it tells me it’s the wrong code. And yes, it’s still not working. its not flexibility. you can just track 10 pages. This plugin is not good for new website owners.